Do you know what’s the difference between a dream and goal? I have always observed people substituting the word ‘dream’ where it should actually be ‘goal’. When you say it’s my dream to run a business, it sounds distant, something that might not be achievable. This is precisely why I never ever give my goals the tag of dreams. But did I believe this from the start? Unfortunately, I wasn’t that wise. Like everybody else, I used to refer my goals as dreams until someone explained the difference between the two. And this became one of the many things I learned and which helped me build my brand. Today, I will share such basic perspectives which eventually lead me to success which most business executioners wait for years to achieve. And there isn’t much to it, trust me, just 7 little things! We all know what Shahrukh Khan said about destiny, right? This was inspired by the quote “When you really want something, the whole universe conspires in helping you achieve it.” from ‘The Alchemist’. It was probably my first book and literally, I haven’t stopped after that. I understood a very simple thing after getting into the habit of reading that there’s nothing that can replace the act of reading. I have made it a habit of spending 30 minutes every day in reading great authors who contribute to shaping my being. In fact, it is my belief that entrepreneurs are always readers. Okay, that’s my belief, but trust me, entrepreneurs belong to that lot who always has a reason. My reason was that when I read, I find some quotes which get stuck in my head and pop exactly when I am in a relatable situation. This helped me get out of difficult times, I wouldn’t say easily but yes, successfully. There are many books related to entrepreneurship which are definitely worth reading. So basically, I first read that reading makes you not only a better entrepreneur but also develops your perspective as a human, I was able to grasp that fact after reading The Alchemist, and then I implemented the habit of reading for 30 minutes. Do you genuinely think curiosity is bad? Seriously, it may kill the foolish ones but definitely not all. In fact, not being curious can kill your existence. This is definitely not something which can be taught, it is something that is weaved in your nature. I have always been curious. I was an extremely curious kid in school and college, I didn’t stop asking questions when I started working, and I am still the same with my own employees. One of my employees is amazing at excel sheets which I was not aware of until I asked him to create a report and he came up with it before I expected. If I didn’t have a habit of asking the Whys and Hows, I would have just taken the report and got back to my work. But I know I couldn’t have done this job within this time frame and it compelled me to ask him how did he do it. Was curious! He then told me how he had done a crash course in Excel and know all the possible shortcuts and everything. Do entrepreneurs have the liberty of calling themselves a 9 to 5 person? Can I tell my client that I don’t work after 6 when clearly they start their day around that hour? Of course, I can if I want to close my shop, right?! Entrepreneurship is a 24-hour thing and the captain has to be by the wheel whenever and wherever needed. So then how do I stay sane and don’t rip off my employees every other day out of frustration? It’s simple, I have to manage my time just to include all the things that I love about my schedule. And I do so by using some precise applications for planning my work and reminding me my everyday’s tasks. I try to wrap my planned tasks each day no matter what my clock shows which is how I make time for the things I love. I make sure I give 30 minutes to reading and not necessarily books. Blogs, influencers, tutorials, or anything that I find of value. Over everything else, I love my pooch and he relaxes me from the core. So I made it a point to start my day really early and the first agenda of my day is to walk my pooch. You gotta stay fresh to keep things fresh at work, and this is how I stay fresh! Anybody who is a budding entrepreneur can relate with the rush of working for that ‘one more hour’. It literally gives you a high. And regardless of what it is, if something gives you high, it is consuming you. Making you weaker physically and mentally by each passing day. Unfortunately, I learned this the hard way. I was so worked up with branding and business acquisition that sleeping, eating, having light moments, etc. seemed trivial to me. Well, the moment of realization arrived with sickness which cost me much more than what I could have made on those days of rest even if I had allotted specific hours to meals, sleep and workouts. However late, I grasped the fact that I first need to take care of myself. My routine now includes a walk with my pooch, regular meals, at least a 6 hours sleep, and frequent weekend trips. I think, if you are not able to figure out the value of important things, you can never be an entrepreneur. If I didn’t have the humility to show my employees that I genuinely am grateful for all the sincerity they show in work, I don’t think I would be any different. Similarly, if I wouldn’t appreciate my employees for a special touch that they usually give to their work, I don’t think I should point out that once in a blue moon mistake. I know these things because I was not born an entrepreneur. I was an ambitious employee working for an organization who then decided to start on his own and have experienced the good and the bad of the industry. And this is how I figured that appreciation and gratitude can do wonders! It has undoubtedly helped me manage a team without having to deal with frequent resignations! When I get associated with my employees or clients, any event in their life will definitely affect mine. For example, if one of my employees is getting married, it will definitely change a few things in my working space. Similarly, if a client abruptly decides to go live in two days instead of 5, again, it will affect me. How far will I be able to go if I don’t befriend patience to bear it all, conviction to offer the best, and dedication to make the impossible possible? Definitely not where I am currently. Somehow, I didn’t have to work on these abstracts as I have always been patient and had to embrace dedication to meet the deadlines. As soon as you understand that making mistakes is an inevitable part of entrepreneurship, you find the strength of moving forward. I was one of them who sought perfection relentlessly and wasted hours on it. But I was sane enough to observe the pattern of procrastination while I chased the ideal. More than the quest for perfection, it was about confidence. Although I had the zest of working, sometimes I lacked the courage of embracing new approaches in fear of making a mistake. However, I read more books, I listened to ample of podcasts, read the journeys of successful techies, and figured out that entrepreneurship is a journey. All you have to do is start at some point and then keep upgrading it. If Apple had waited to get their first device as savvy as the latest X, well, I don’t need to complete that, do I? 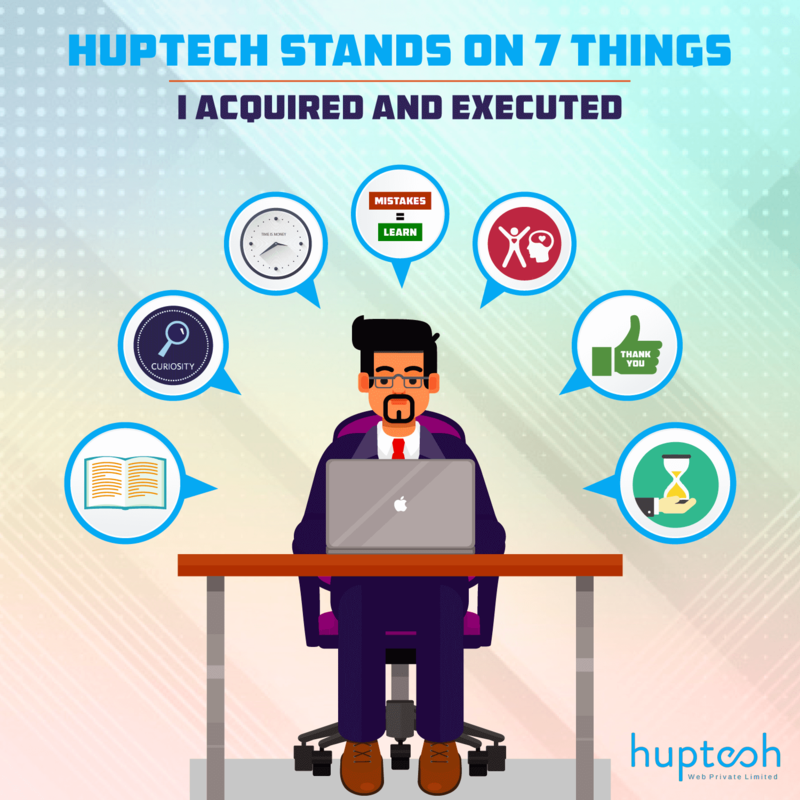 These are the ultimate 7 things which are enabling me to make Huptech Web a better place for both, my clients and my employees.